"Since this savory sauce uses beef broth, instead of the pan drippings, it can be made ahead. Add arrowroot only when ready to serve. 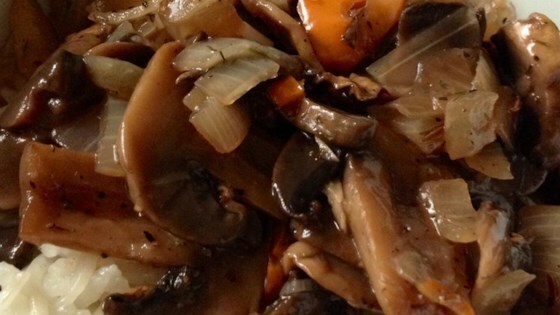 I usually use white mushrooms; I have also used chanterelles." In a medium saute pan, melt 1/4 cup butter over medium heat. Add sliced mushrooms; cook and stir until soft. Remove mushrooms from pan, and set aside. Add 1 tablespoon butter to pan, and melt . Add shallots; cook and stir until translucent. Add mushrooms, and cook until soft. Add thyme, bay leaf, and red wine. Reduce. In a small bowl, dissolve arrowroot in 1/4 cup cold beef broth. Stir remaining broth into sauce, and bring to a boil. Whisk in arrowroot mixture, and stir until thick. Add reserved mushrooms. Season to taste with freshly ground black pepper and salt. Halibut fillets are pan-roasted with mushrooms in a simple lemon butter sauce. Wonderful sauce for steak B.B.Q. or broiled. My sons loved it. Did not use arrowroot or tyme. Replaced shallots with garlic. And consumme instead of beef broth. Excellent and easy! Great way to impress company. Subbed 2x corn starch for Arrowroot since I had none. Worked GREAT. This a great recipe. I added a tablespoon of cornstarch to thicken it a little more. Very good! I used about 2 tbsp. of olive oil instead of all of the butter. I also used some chicken soup mix with water instead of the beef broth.